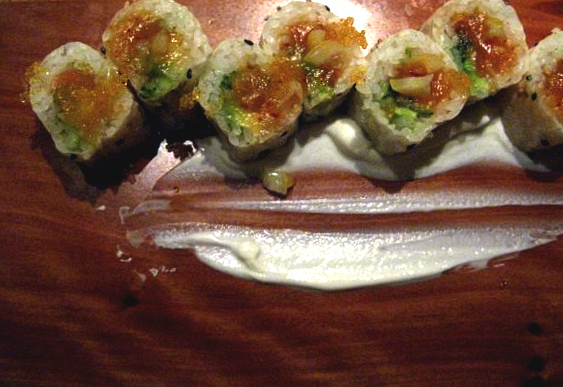 Austin Eavesdropper: You're welcome, mouth: Dinner at Uchiko. You're welcome, mouth: Dinner at Uchiko. I think Ross and I may be christening a new "special occasion" restaurant: Uchiko. 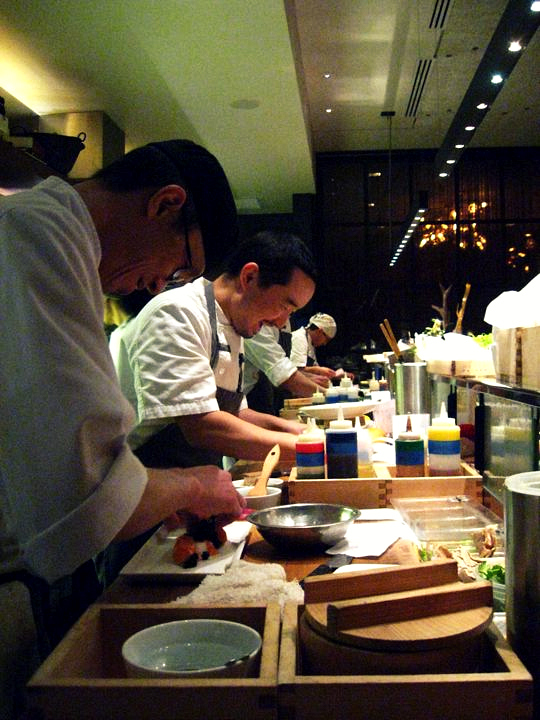 Oh out-of-town readers, I wish you could experience Uchiko. Last Saturday marked the fourth time I've dined there, a restaurant that's been open less than half a year. The 'special occasion' this time was the fact that I had a gift certificate to it. And, the fact that Ross and I have been hard up on Date Night lately because life got ... how do I put this? Cray cray. We got a seat at the sushi bar, the very first time I've gotten to eat at the sushi bar here. Guys, this may be how I ALWAYS enjoy Uchiko. It's like watching TV. The sushi chefs chop-chop-chop up fish, and talk to you at the same time. We were tickled. The first roll we ordered was the Yokai: Atlantic salmon, myoga, golden beet, soy paper. What is myoga? Who knows. But what I DO know is that this roll also contains mint, and that the soy paper (the dried shavings you see on top of the roll) is faintly sweet. Those two sensations do something extraordinary to that rich salmon, and it's all very refreshing, taste-wise. This roll reminds me of summer. The next roll we ordered was the George, and PS, doesn't this picture look like a face? Teehee. Anyway, the George contains: Smoked atlantic salmon, avocado, preserved lemon, Skyr yogurt. We ate this up in about ten seconds. Uchiko has such a handle on their fat/astringent flavor combinations, and almost everything you order here delivers that decadent, warm mouth feel, followed by a light, tangy something dancing on the sides of your tongue. I've heard it said that sushi is a cuisine of bites -- you're always trying to engineer the perfect bite -- and Uchiko consistently engineers their rolls in this manner. Tiny bits of ingredient layered together to surprise and charm. We then received this dessert (special) on the house. We don't know why we got it on the house, but Ross and I did not argue. This was one of the most turn-me-on desserts I've had the pleasure of tasting, ever, and before you accuse me of getting too hyperbolic when talking about food (which is true), let me just describe to you what you are seeing, above: Saffron gelato. Olive oil semifreddo. Toasted pistachios. And I think a lemon foam. After Ross and I dove in like savage wilda beasts, our waitress demurely suggested, "it's best if you taste everything in one bite," and when we did that -- oh. Fuggedaboutit. We almost slid off our sushi bar stools and died right there. I've said it before and I'll say it again, that the savory/sweet dessert thing isn't for everybody. But it is certainly for me. 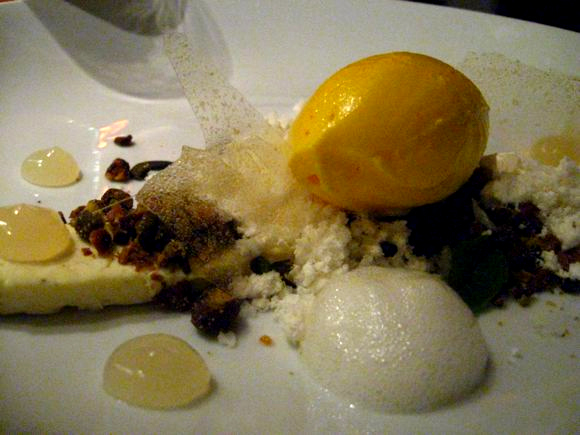 My exact words regarding Uchiko's dessert menu last September were, ahem, "if I could bathe in this stuff, I would." Subtlety is not a gift of mine. This is the last picture I wanted to show you: Those rad light fixtures! Where did they come from? Maybe I'll call up Michael Hsu and ask him. Austinites? 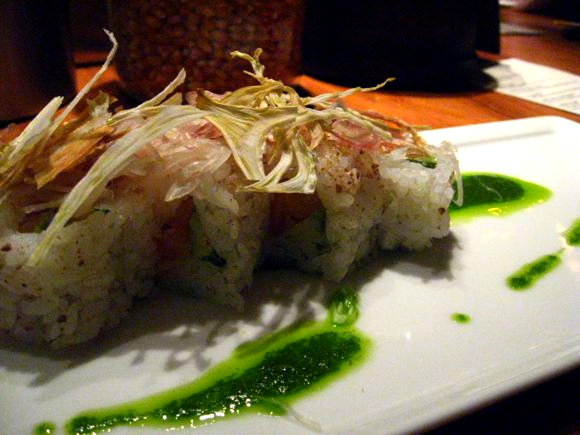 Have you dined at Uchiko yet? 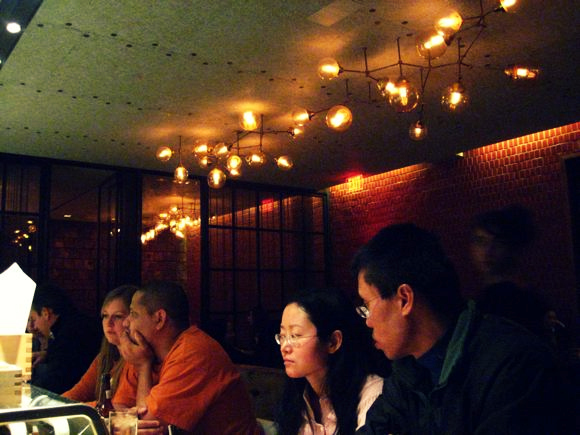 The restaurant GQ Magazine named one of the 10 best new restaurants in America? If not, well. You know what to do! We went on New Years Eve and I split their special tasting menu ($150) with two other people for an eight course rainbow meal that was coordinated with each color. It was heavenly, and unlike anything I've ever tasted. You're right about the sweet/savory--and oh! the textures in each bite! The George is fabulous! Sounds like I must try Yokai on my next visit. Great picture of the chefs chopping away. Hi Tolly! It was great meeting you last night. I hope you enjoyed Trace as much as Becky and I did. She told me that I have to go to the next Bleetup, so I'll see you again in the near future! I love, love, looove Uchiko. I wrote about them for an Austin Monthly feature and they were so generous and have a very obvious passion for what they do. It's a great place! I've been dying to try this place. I need to put it on my 'to-do' list. Everything looks SO good! I was there a week ago for the first time and I. CAN'T. STOP. THINKING. ABOUT. IT. I find myself just craving different things I had there. I can't stop. Must go back soon. Haven't been to Uchiko yet but their parent restaurant Uchi on S. Lamar is one of my favorites. Every time I've eaten there we got a free dessert too...wonder why?! secondly, i live in austin as well and have heard so much about this place, but haven't gone yet. I'll have to try Uchiko again. I must have gone on an off night because all the dishes I had were a tad ... off. I really wanted to like it because I LOVE Uchi, and it's walking distance from my house. However, for some non-fusion Sushi, you have to try Musachino. It's my go-to place for nom nom nom. That's awesome about the GQ lovin', it looks like a nice place! man o man i just ate there last night... coulda died right then and been happy. yum. oh my god so good. i would go broke eating there if i could. nom.